We are big pizza lovers in our house. Pizza is definitely one of my favorite foods, and I'd probably eat it every day if that was a choice. Clearly, it's not, but a girl can dream. 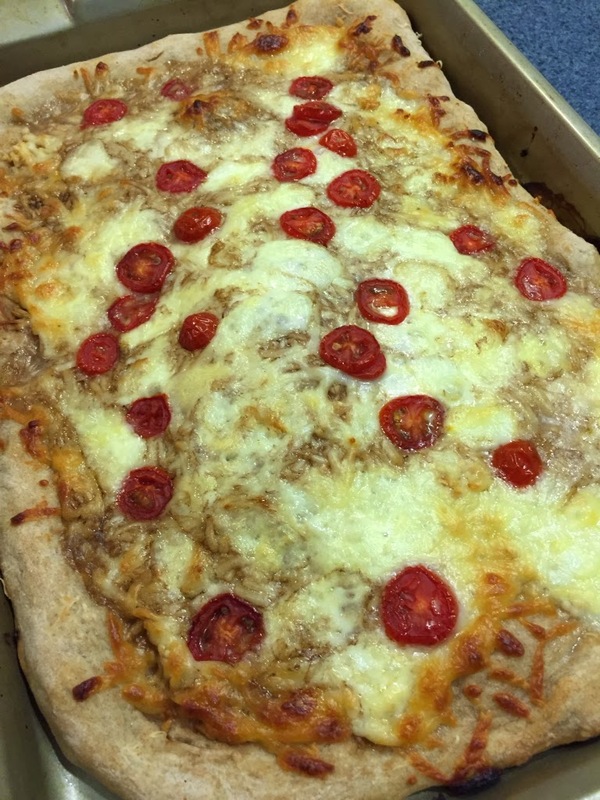 We make homemade pizza just about once every week, and though we often stick to a simple cheese pizza, Rich decided to switch it up recently, and with delicious results! 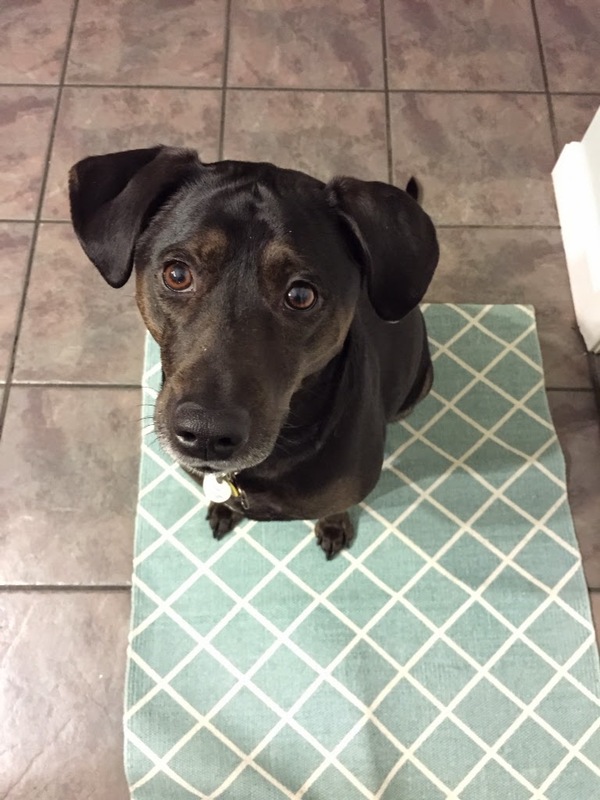 He loves to play with recipes, and is almost always spot on with his experimenting. 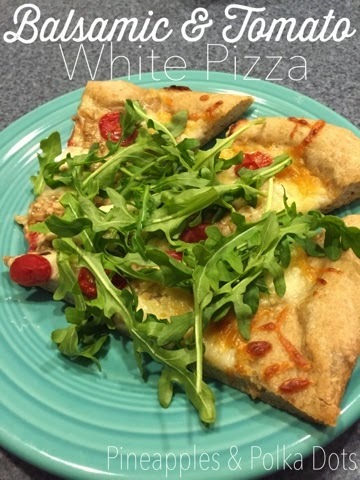 Last week, we tried a tomato and balsamic white pizza topped with arugula, and it was one of the best we've made. I thought I'd share in case you want to try it out, too! 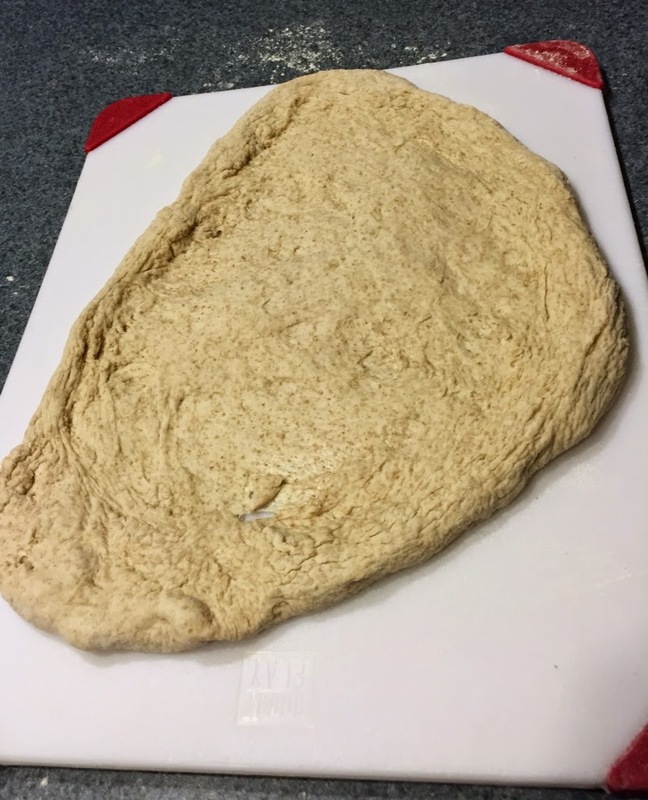 We usually start with a wheat dough ball from our grocery store. We've made homemade dough many times, and when I do make it, I usually use this great recipe from the Pioneer Woman. On a weeknight, though, a premade dough is a shortcut that definitely helps. Either way, it will be delicious! I take the dough out of the fridge as soon as I get home, so it has plenty of time to get to room temperature. Sometimes, we set it by the wood stove to speed up the process. It doesn't need to be hot by any means, but a cold dough is hard to stretch out, so room temperature is what you're aiming for (at least an hour). 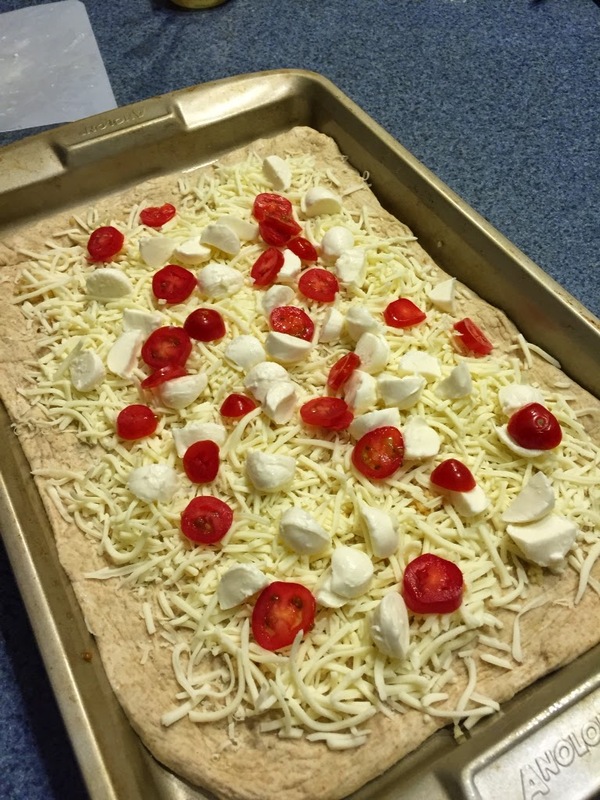 While you're waiting, pull out your other ingredients: olive oil, garlic, cherry tomatoes, fresh and shredded mozzarella, Parmesan cheese, and balsamic vinegar. Before you start, preheat your oven to 400 degrees. 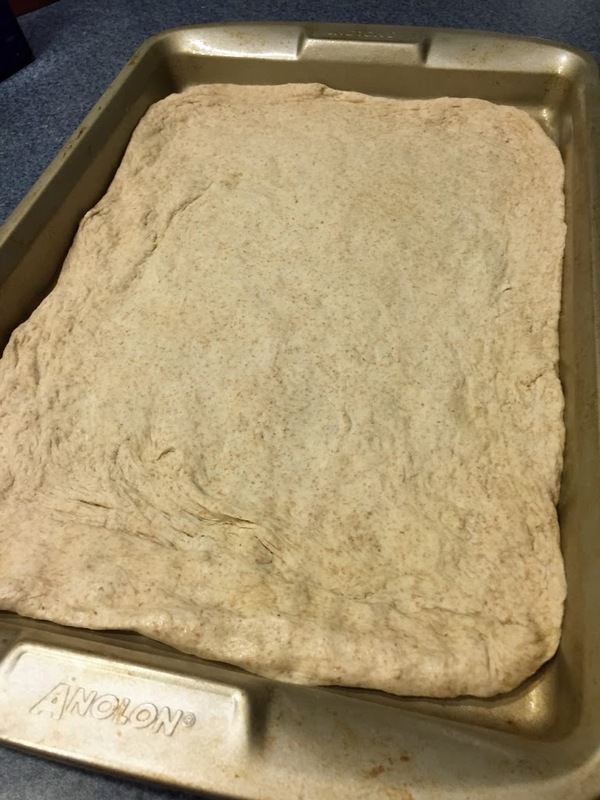 First, turn the dough out on a floured cutting board. Shape it into a flat, disc-like shape and stretch it out a bit. 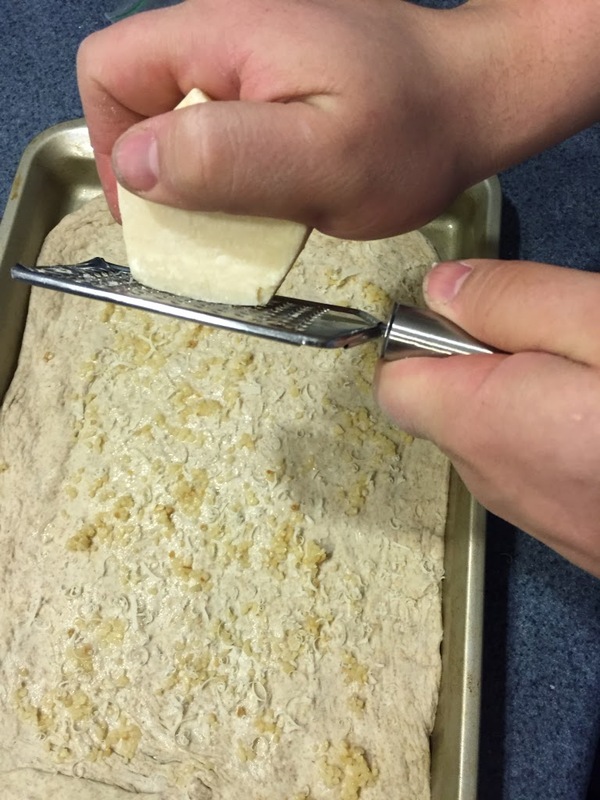 If the dough tears, like ours did above, just pinch it back together or add a small chunk from the edge. It'll be okay, I promise. Next, if you're using a baking pan as opposed to a pizza stone, coat it with liberally some olive oil so it doesn't stick. 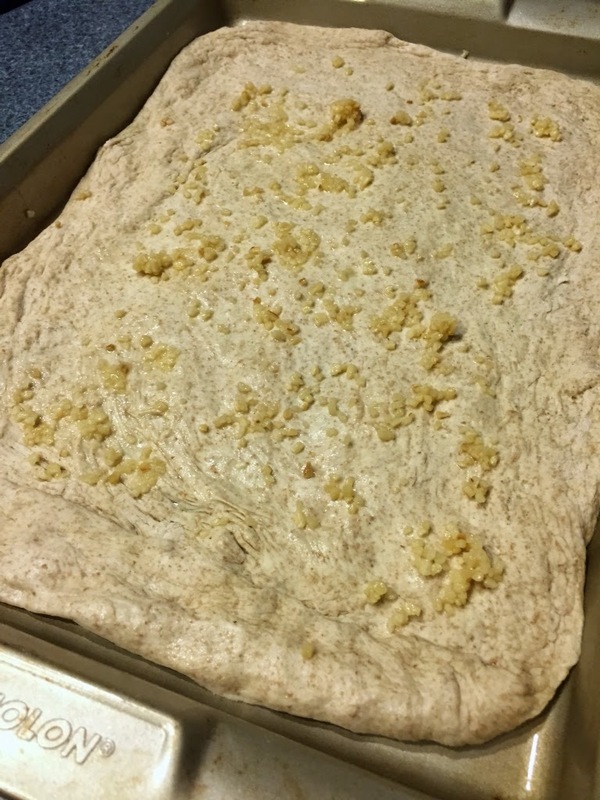 Spread the dough out onto the pan, shaping it into a rectangle and stretching it to a fairly even thickness. 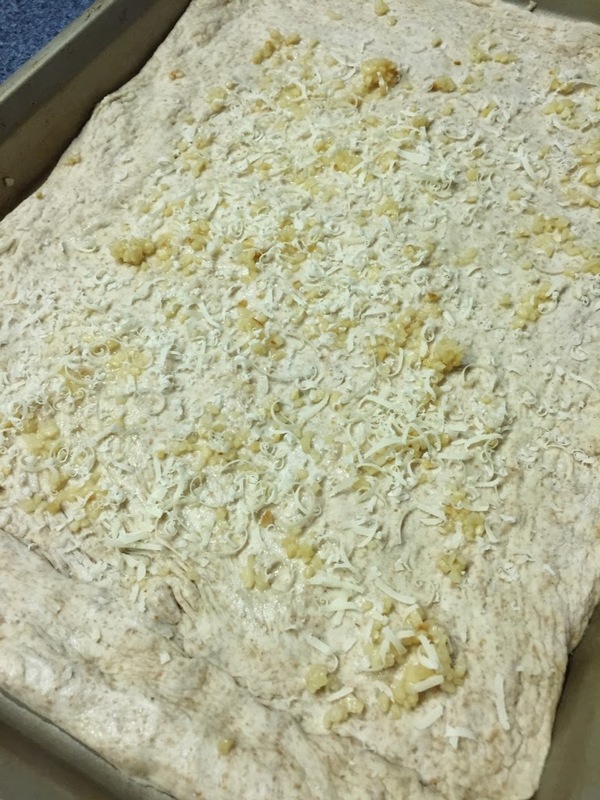 Then, spread garlic all over the dough, using as much or as little as you like. We sometimes use jarred, minced garlic and sometimes grate our own. Whatever you have on hand is fine! 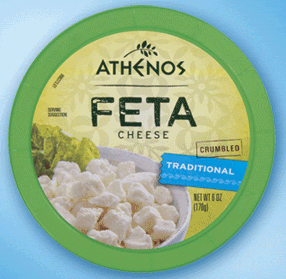 Next comes the Parmesan cheese. We had a block of Parm so Rich grated that up, but again, whatever you have will work. Give the crust a good coating of cheese. Next, dice up some fresh mozzarella (we quartered cherry-size Ciliegine) and some tomatoes (we used cherry tomatoes). Add them to the pizza. Rich is a hesitant tomato-eater, so we don't add tons, but you can certainly add as much tomato as you'd like. 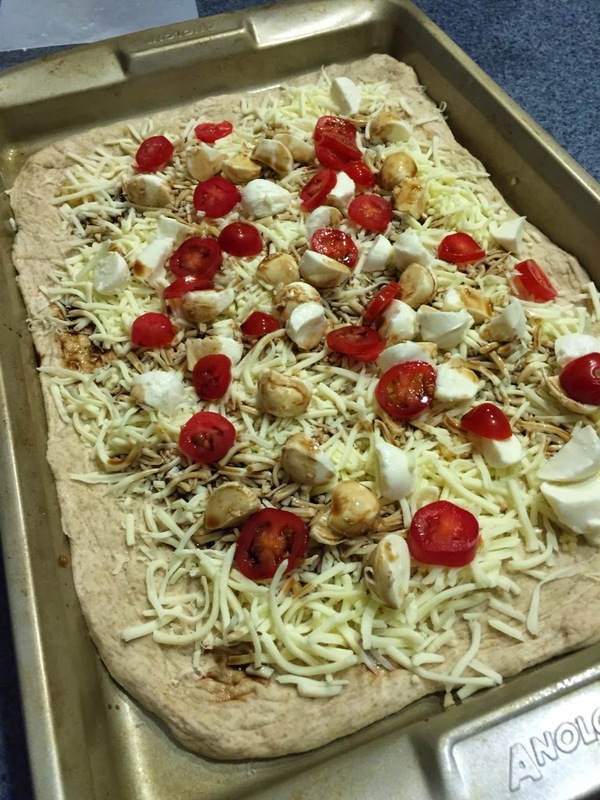 The last step is to drizzle the whole thing with some balsamic vinegar, and then pop it into a preheated oven for 15 minutes. This is a good time to prep your arugula. I wash it and take the stems off, so we're just putting the leafy parts on the pizza. After 15 minutes, I check the pizza, rotate the pan for even cooking, and add 5 minutes. After 5 minutes, check it again. I look for all or almost all of the liquid that formed on the top during cooking to be re absorbed and cooked off. If your pizza has some liquid in the center still, give it a few more minutes to set. I'd say we end up usually baking it 20-25 minutes in all. It's good to check on it a couple of times (at the 15 and 20 minute marks) so it doesn't overcook. Your oven might run hotter or cooler than mine, so just use your judgement. I would add more time before I turned up the temperature, though, because your crust can quickly get too hard in a too hot oven. 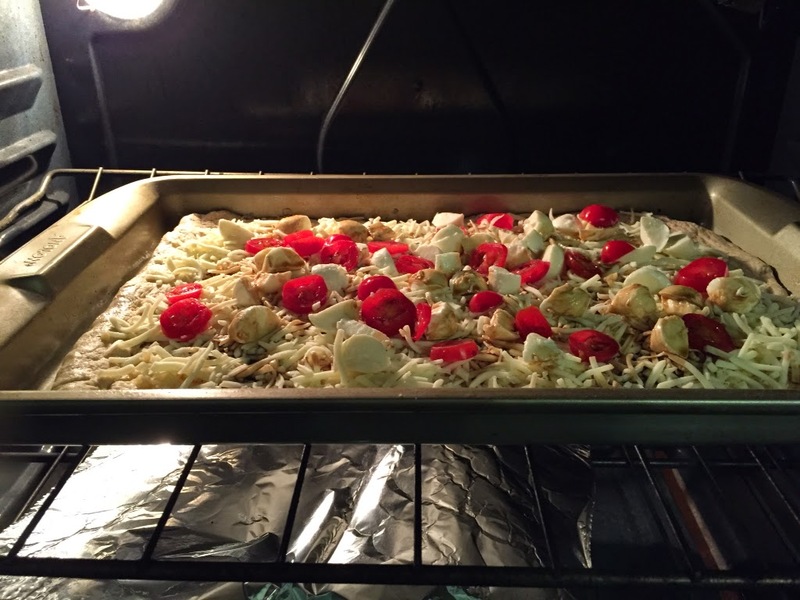 Once the pizza is done, take it out and let it cool in the pan for a few minutes. Then, I use a spatula to lift it around the edges to be sure it didn't stick in any spots before I try to pull it off the pan. Next, just use the spatula to slide it out of the pan and onto a cutting board. 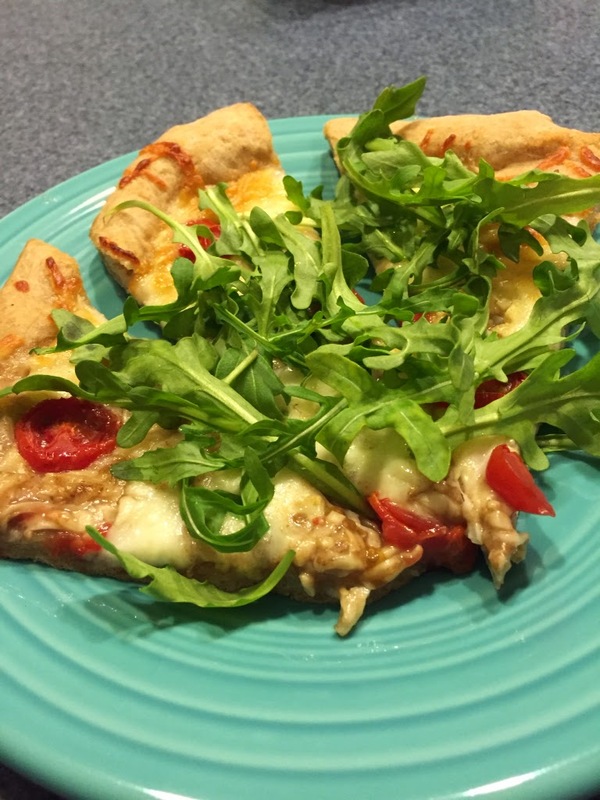 Add the arugula, slice, and enjoy! 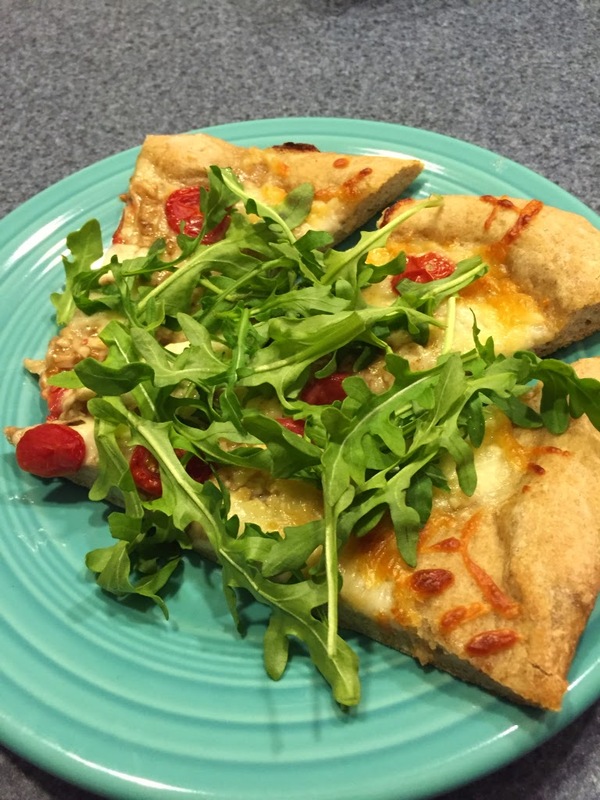 This is one of our favorite pizzas to make at home now! Stretch the pizza dough onto an oiled pan. 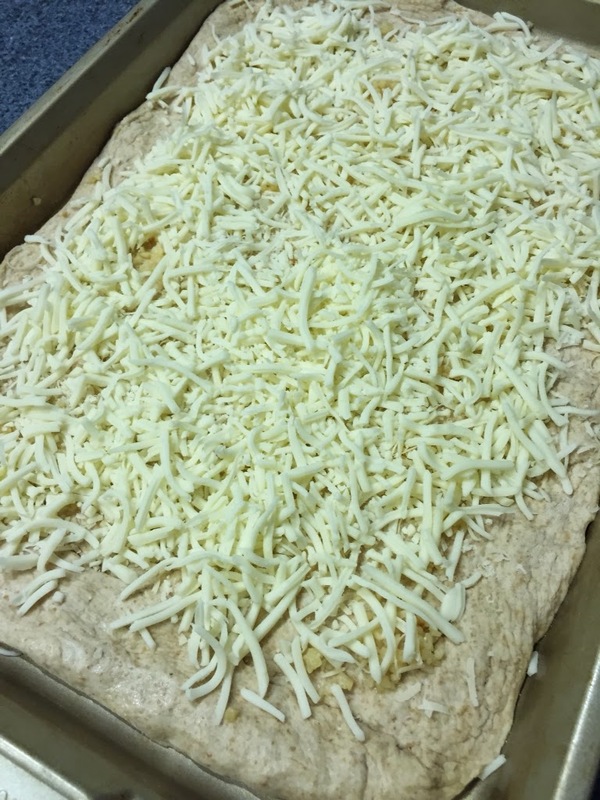 Top dough with minced garlic to taste, then sprinkle on grated Parm and shredded mozzarella. Top with diced fresh mozzarella and tomatoes, then drizzle with balsamic vinegar. Bake for 15 minutes, and check it, rotating the pan for even cooking. Continue to bake in 5 minute increments until the liquid on the top has cooked off and cheese in center is melted fully. 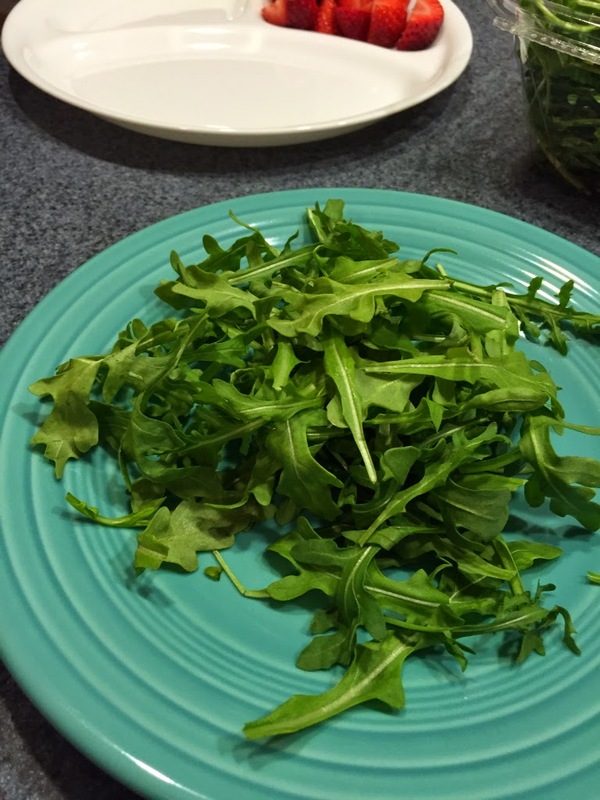 Let cool on the pan for a few minutes, then top with arugula. Slice and enjoy! 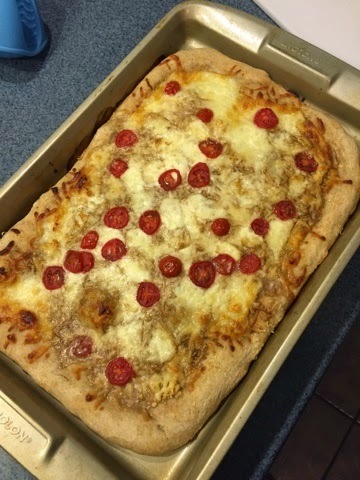 Do you make pizza at home? What do you top it with? We are always up for new ideas! Also, in case you missed it earlier in the week, check out our mini-road trip here! 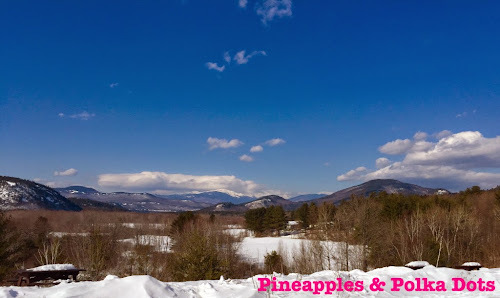 We are super lucky to live only an hour or so from North Conway, New Hampshire, which is one of my favorite NH towns. Growing up, my family vacationed there several times, and Rich and I have stayed a couple of times and visited many! 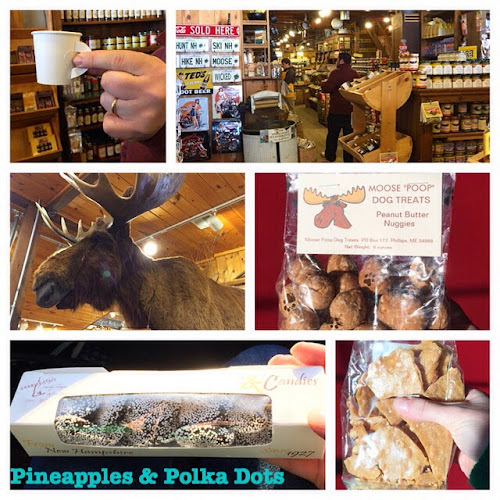 We love the great food, fun little shops, great outlet stores, and adorable atmostphere. Today was the one day this week that Rich didn't have basketball, so we took the opportunity to take a drive, do some shopping, and grab lunch. We got a few great deals at the outlets (some Smartwool socks, pants for school, and some cute, brightly colored sneakers for me, and a sweater and hoodie for Rich). We also were sure to stop at Zeb's General Store, which is one of my favorites. It's a two-floor old-fashioned general store with a super long candy counter and all of the salsas, dips, sauces, sweet treats, and other items you would pretty much ever want. I could get lost browsing in there for entirely too long, and I always end up with more than I intended to, but... YOLO. We picked up some of our favorite dip mix (it makes a spicy garlic dill- yum! ), some peanut brittle, and some nonpareils which are made at a Granite State Candy in Concord (best candy store in Concord, for sure). 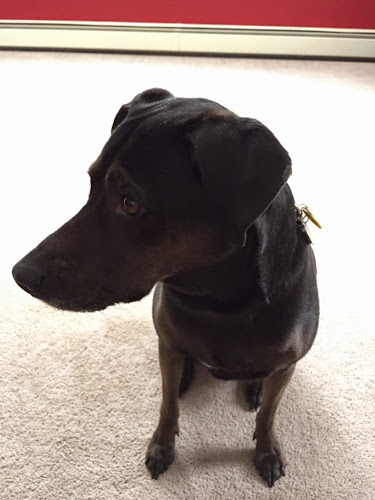 We also grabbed some peanut butter Moose Poop dog treats for Lucy. She's a big fan of anything peanut butter. Also, there's a life-sized stuffed animal moose who talks and tells jokes, so I'm pretty much sold. 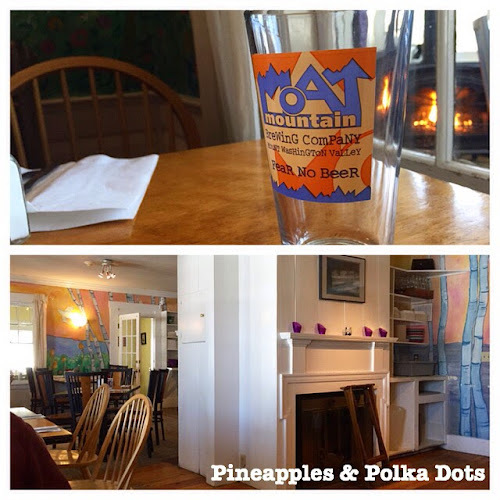 We grabbed lunch at one of our favorite places- Moat Mountain Brewing Company. They have the most delicious food, Rich loves the beer. The atmosphere is relaxed and has tons of character. We love it there! The Intervale Scenic Vista is right down the street from Moat Mtn., and I always like to stop by to see the beautiful mountain view! Even though it was one of the warmer days we've had lately, it was still super windy and a bit chilly! I ended the day playing outside with Lucy, since the sun was so warm and the day was beautiful! 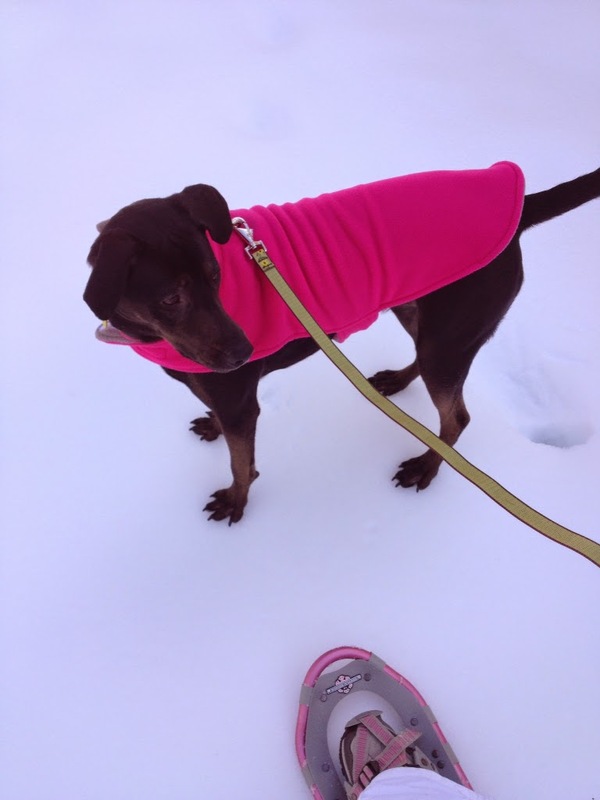 She loves to jump in and out of the snow banks, sniff all of the deer tracks, and patrol the woods to see if she can spot her "deer friends". Ha. If you couldn't tell, I'm loving vacation. Days like today are just what's needed to recharge, reconnect, and enjoy where we live! Tonight, we're making some pizza for dinner and watching Whiplash, which Rich has been wanting to see. What do you love to do to fully enjoy vacation? Today was pretty perfect in my book! First up is my Klean Kanteen insulated bottle. I love my raspberry pink coffee thermos! The website says that it can keep hot liquids hot for 6 hours and cold liquids cold for more than 24. I've only used it so far for coffee and cocoa, but I believe it, since it certainly kept my coffee warm all morning. It works even better if you warm up the bottle with some hot water inside before pouring in your coffee. I also have the cafe cap to turn it into a travel mug. The whole thing is super easy to clean and doesn't hold smells. I'm in love! Another thing I can't live without in this crazy, snowy winter? My Bogs boots! They are comfy, waterproof, and can totally withstand the daily schlep back and and forth into school from our not paved, always wet, muddy, or snowy parking lot. I always wear fabric or leather flats at school, and they would get totally ruined in the parking lot. I pretty much wear my Bogs all year round, or at least from about October or November to May. They are not too hot in spring or fall months, and with a pair of wool socks underneath, are plenty warm in the cold. The top part is stretchy, comfy neoprene, and the bottom is colorful rubber. These are similar to mine, which I've had for several years and are still going strong- they've helped shovel about 89432 feet of snow this winter! Speaking of winter (again, ugh! ), the dry weather has been making my long and thick, but fine, hair super staticky and it's driving me crazy. 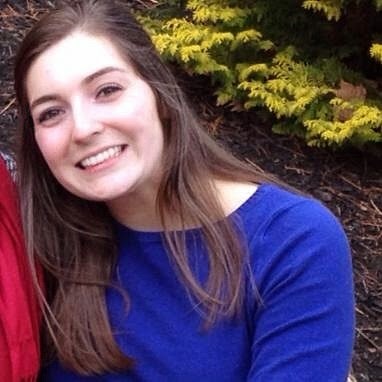 I've been using Biosilk Silk Therapy, and it's been helping quite a bit! I love the scent, and it helps to moisturize dry hair, while keeping it less staticky. If your hair is dry or just all over the place, I recommend this for sure! I use it only on the ends and bottom half of my hair, so I don't find any issues with it making my hair more oily (but, as a disclaimer, I have pretty dry, non oily hair to begin with). People at the grocery store ask me all the time about my reusable produce bags. I bring my reusable shopping bags each week, and it just doesn't make sense to use a whole bunch of plastic bags in the produce department. I love these mesh bags, and they've held up really well for a year or two. I wash them in the washing machine sometimes, but to be honest, I often just scrub them up with a little dish soap and dry them on my dish rack when I'm doing the dishes. Even though they're white, things like deep purple cabbage or dirty potatoes haven't stained them. They are inexpensive, and have saved me from using tons of unnecessary plastic bags. One other thing I'm really into right now is my Fitbit Flex. I got it for my birthday in September, and so I've been using it consistently for about 5 months. I have been tracking my exercise and nutrition in My Fitness Pal via the iPhone app for about a year and a half now, so I love that the Fitbit automatically adds in my steps and adjusts my daily calories. 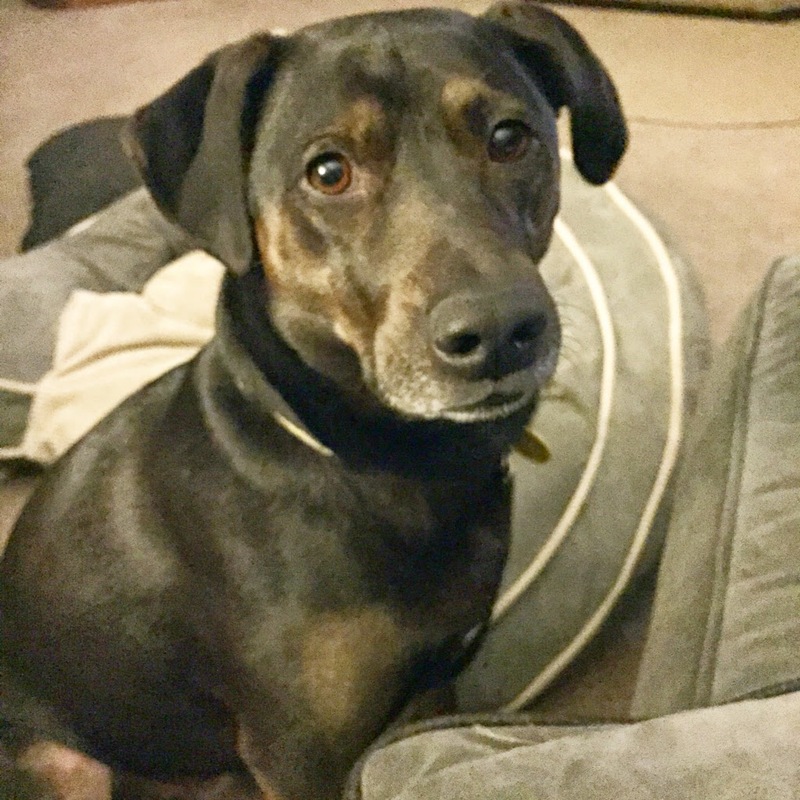 While I'm by no means a heavy exerciser, I do move around a lot during the day, and get out for walks with Lucy very regularly when it's not an arctic freeze outside. This counts my steps and can tell me how many I've gained throughout the day with a quick tap. The Fitbit also tracks sleep quality and time, so if you're someone wondering about your sleeping habits, this is a neat tool! I like the interchangeable wristband- you can put the actual tracker into whatever color you like. Of course, I chose hot pink because, why not? The other thing he's into? Porters. Rich is big into craft beers, especially from local microbreweries. He says that in the depth of winter, nothing warms the soul quite like a tall, dark, frothy porter. 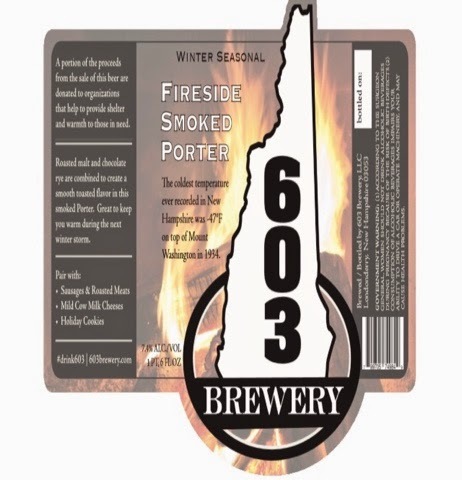 He recommends the Smoked Vanilla Porter from Stone Brewing Co. (not local), and the Fireside Porter from the 603 Brewery. If you enjoy a heavy beer with a slightly bitter taste, a porter is for you. What are you into right now? I'd love to hear about it! Next week is February break for both Rich and me. Lucy couldn't be more pumped! We're lucky to teach in two districts with the same vacation weeks! While Rich will be coaching basketball throughout the week (it's the final week! ), and I will have some grad school and preschool work to do, we'll have time to do fun things, too! 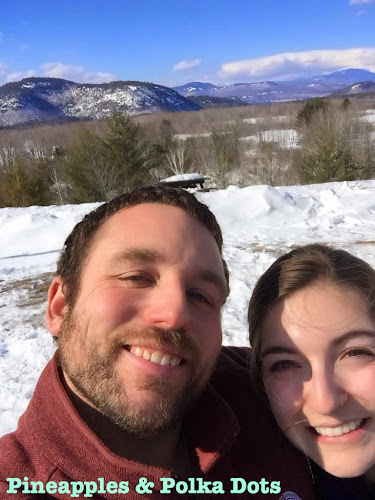 Rich said that his vacation wish list includes going out to eat somewhere we love or someplace new, doing something fun together, and maybe taking a day trip. We live not too far from some pretty cute northern NH towns which have great restaurants, some shopping, and lots of charm! 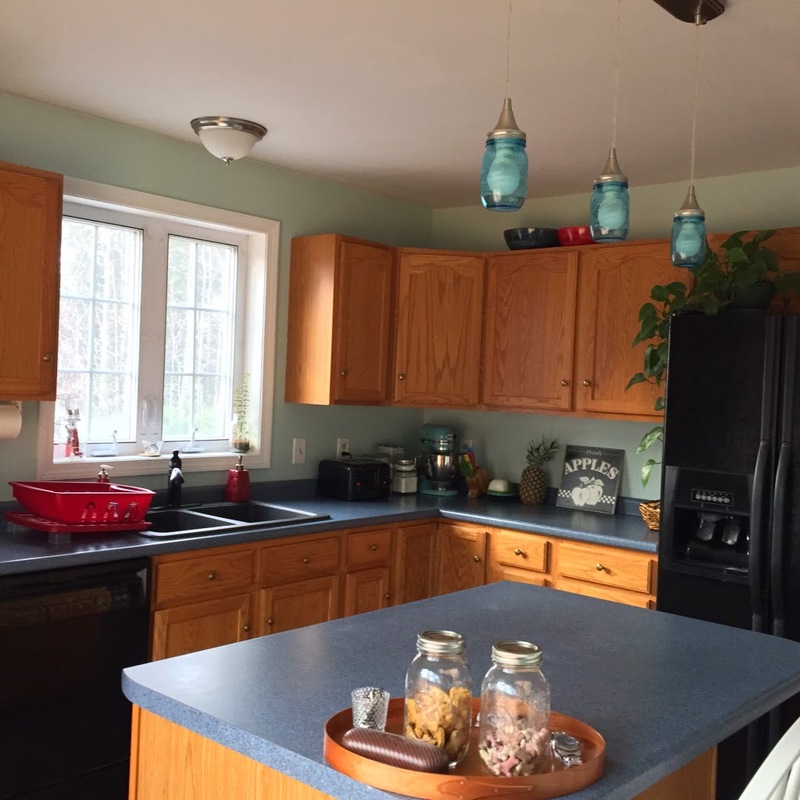 Before I talk about my vacation to do list, I'm excited to not have to think about painting the kitchen! It's been hanging over my head for many vacations now, and it's so nice to have that checked off of my to do list! Bonus: my mom won't even have to gently bring up that I should do it. Check that off YOUR vacation to do list, Mom! First off, I will spend PLENTY of time snuggling this girl. On the couch. By the fire. There is nothing like having nowhere to go on a frigid New Hampshire winter day and spending the day snuggled up in a cozy house! Bring it on. 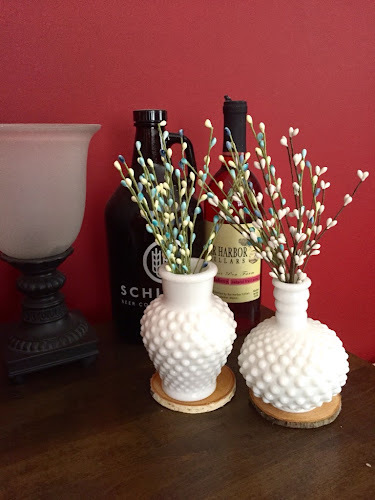 I'd like to get my stenciled flower canvasses hung up in the living room, and it's probably just about time to take down the Valentine's Day decor (though, in truth, it will probably end up staying put until it's officially time to celebrate spring!). I love Rich's idea of taking a little drive to somewhere cute for the day and grabbing some lunch. We used to do things like that so much more often, it would be fun. 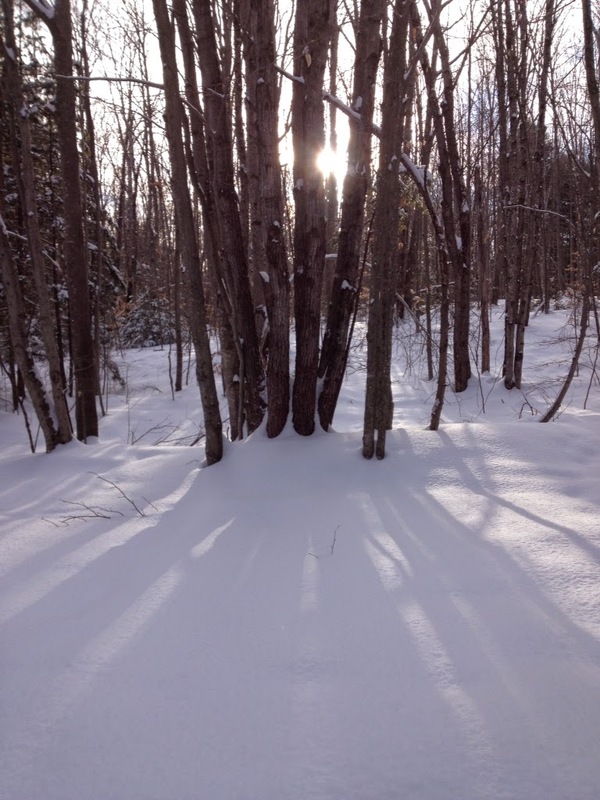 If it ever gets to a reasonable temperature outside, I am dying to get out snowshoeing! It seems like it's either been blizzarding or below zero almost all month! Also, I have a couple of projects with materials and ideas ready and waiting to go. I'm hoping to get some inspiration and motivation to get some crafting done! You know I'll be sure to share! Now, if only I could motivate myself to get a paper written and checked off of my to do list early, that would be great. If you're a teacher also on vacation for a week, what are your plans? With the 5th snowy weekend in a row, my fingers are crossed we won't spend a whole week shoveling! 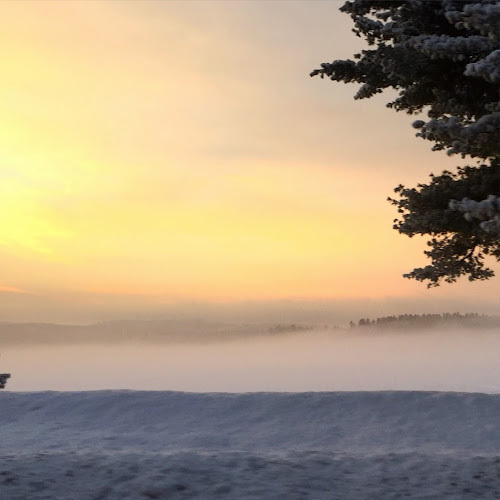 I'll leave you with this beautiful, snowy sunrise I caught on my way to work the other day. Happy Friday to everyone, on vacation or just pumped for the weekend! So... Pineapples and Polka Dots. What does that even have to do with anything? 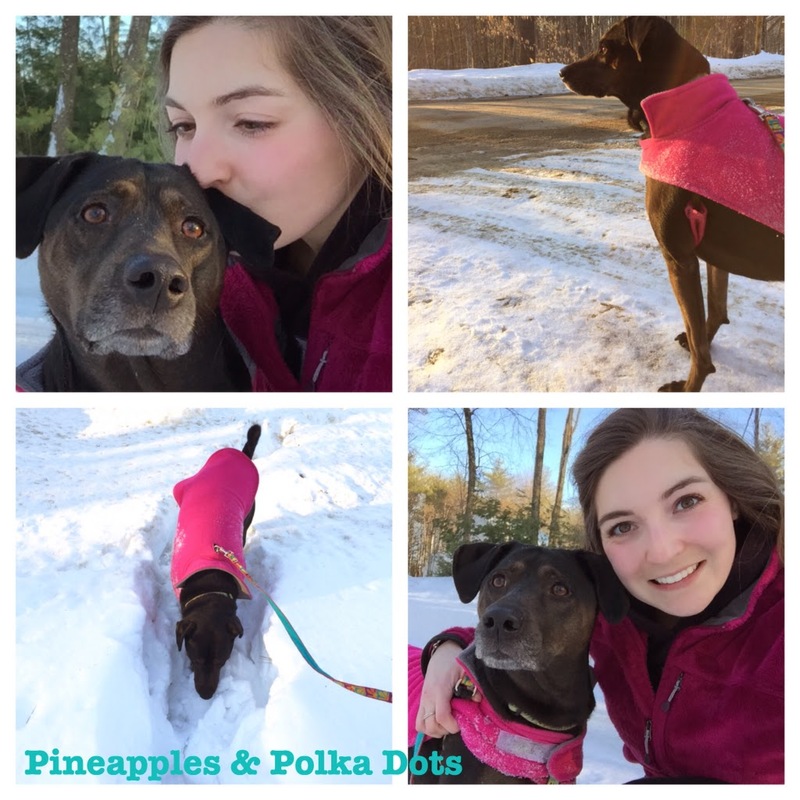 Let me first just say, pineapples and polka dots are two things that I really love. I love to eat pineapples, I like how they look, and I just think they're fun. 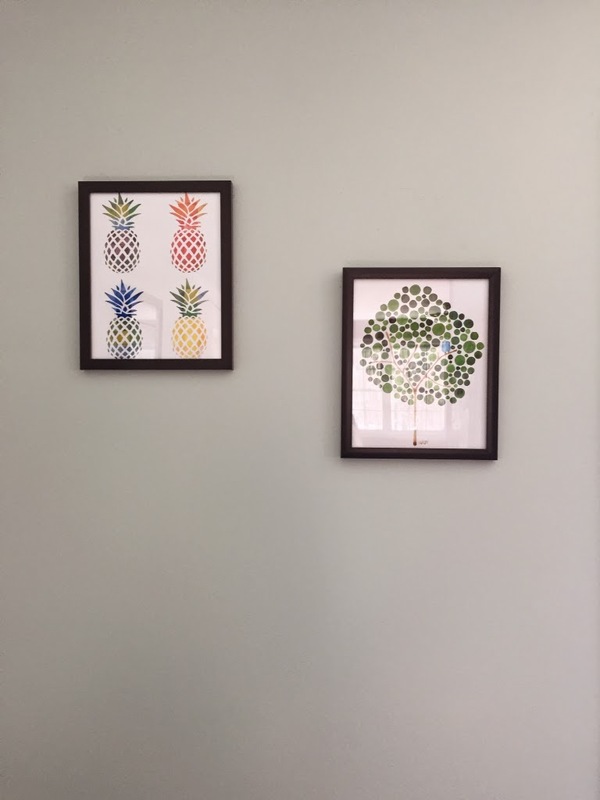 Also, did you know that pineapples are a symbol of welcoming and hospitality? Pretty great, right? 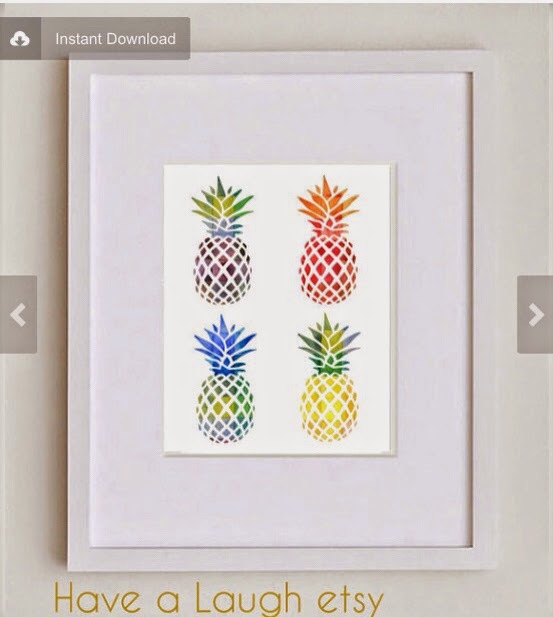 In high school, my best friend Jillian gave my mom a stuffed pineapple pillow, and its tag talked all about the background of the pineapple as a symbol. I loved the concept, and it doesn't hurt that I love pineapple and pineapple flavored things, either! I have a few pineapples around the house. We have this storage bench in our dining room, which used to belong to my parents. 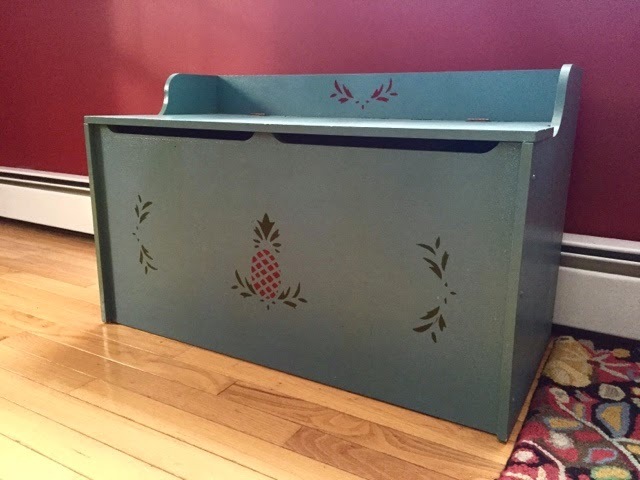 My mom hand stenciled it, and I love the pineapple! The colors are perfect for the space, and I love that my mom painted it for their home so many years ago! I recently purchased this watercolor art print as a digital download on Etsy from Have a Laugh. I love digital downloads because there is no shipping fee, they are inexpensive, and you can print and frame them immediately, as opposed to waiting for them to be shipped and delivered. This is hanging in my kitchen with another watercolor print. Please excuse the glare... It's a tough to photograph spot. Lastly, I often have a pineapple ripening on my counter, or cut up in my fridge. Did you know that it's a good idea to set them upside down (not pictured below...) while ripening to allow the sugars pooled at the bottom to spread throughout the fruit? I usually just put the leaves down into a big vase and let it hang out for a few days. This prevents the problem of a soggy, rotten bottom with a crunchy, unripe top. No one wants that... Anyway, you get it, I love these. See it back there? This is like Where's Waldo? 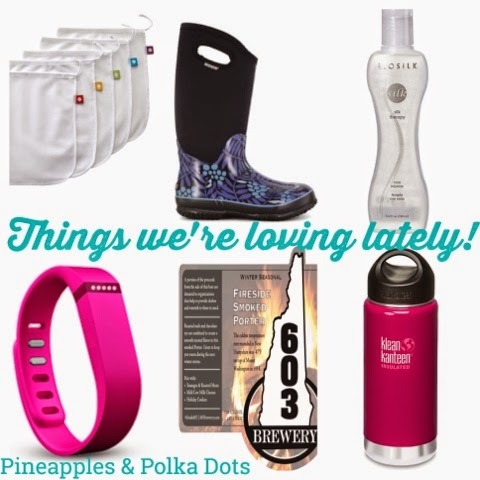 So enough about pineapples, let's talk polka dots. My all time favorite pattern, I don't know that I've met many polka-dotted items I haven't liked. Unfortunately, it's probably not a great idea to cover our entire house with dots, so I pick and choose, adding over time. 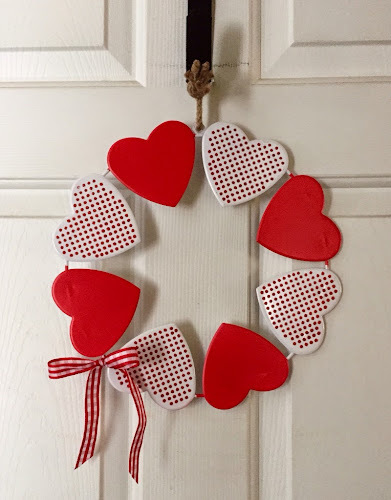 I've mentioned before that I blogged all about planning our wedding and diy wedding projects on a blog called One Polka-Dotted Day, so it seemed natural to link the two blogs with the theme. 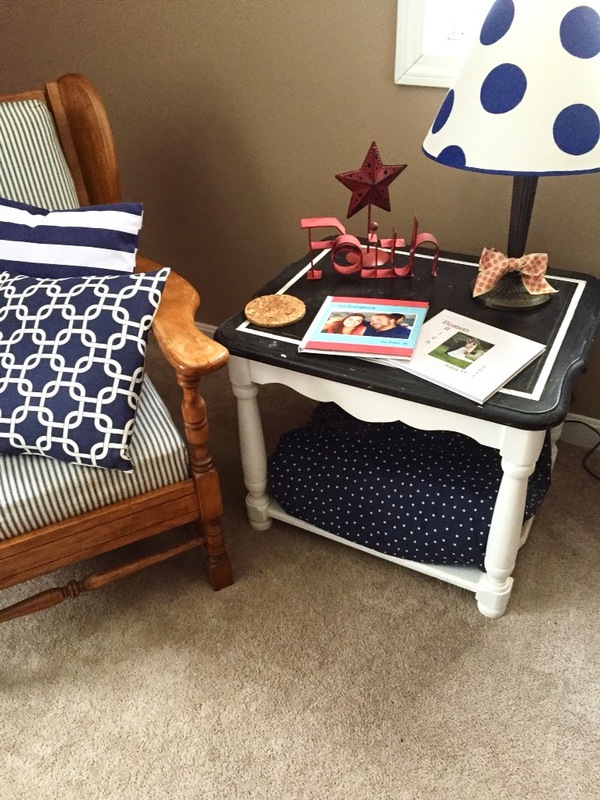 I have a polka dotted blanket, from my college dorm room actually, that typically lives on the couch or under this side table in our living room, alongside its new neighbor, my polka dot lampshade. I love that blanket! My new Valentine's Day wreath is another polka dot accent. 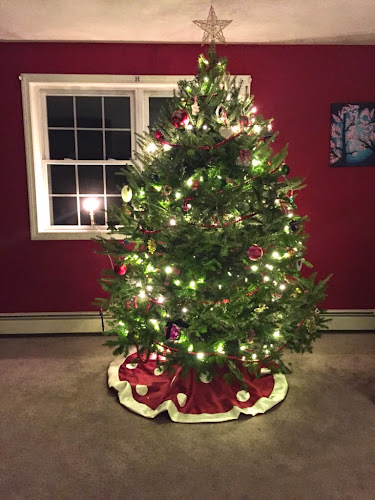 Our Christmas tree skirt is a cranberry and white polka dot print, which I love. Finding a red that went well with the wall it needed to sit next to, along with a design I love was a real win. Another polka dotted media that I adore is hobnail milk glass. I love these little white vases, currently holding wintery white and blue berry sprays. I tend to update them during the year with evergreen sprigs, flowers from the garden, or berries. 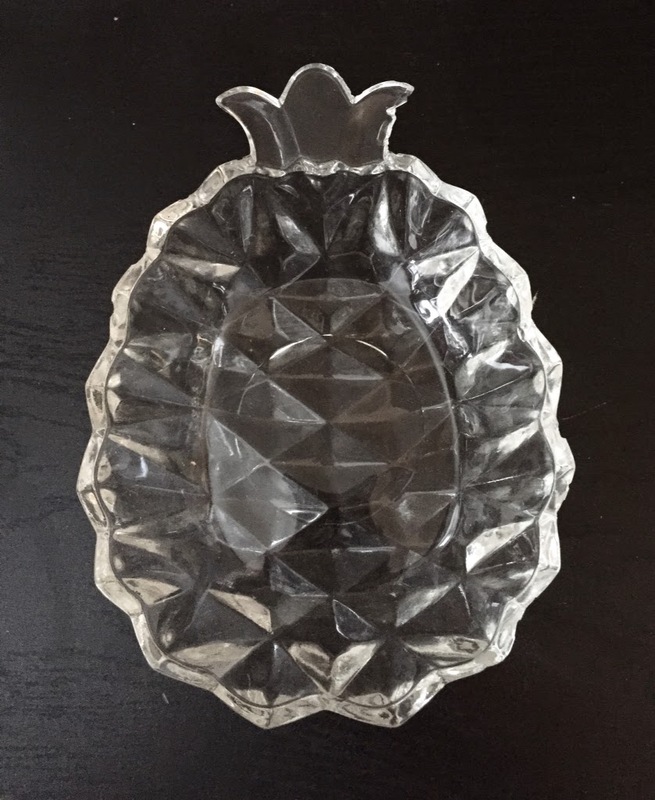 This hobnail glass dish was a gift from my sister. 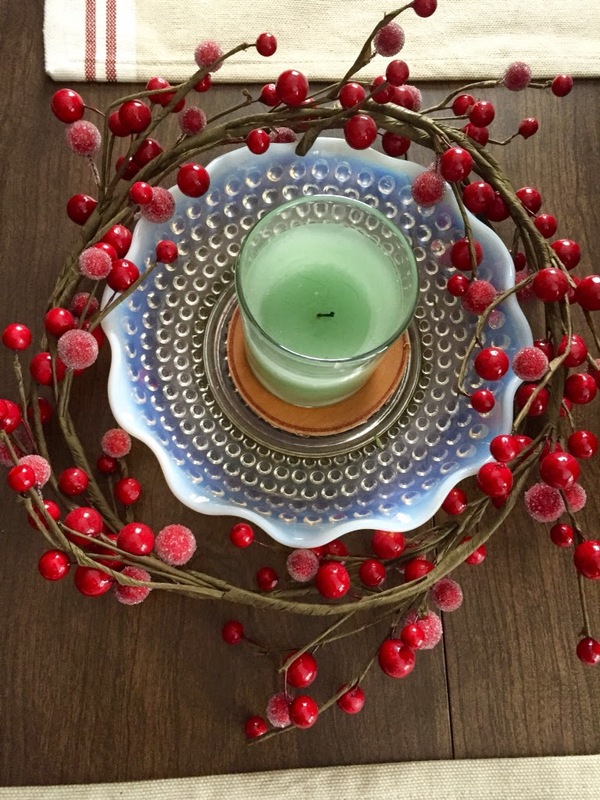 It has a matching bowl which I use to hold greeting cards and a vase, too. 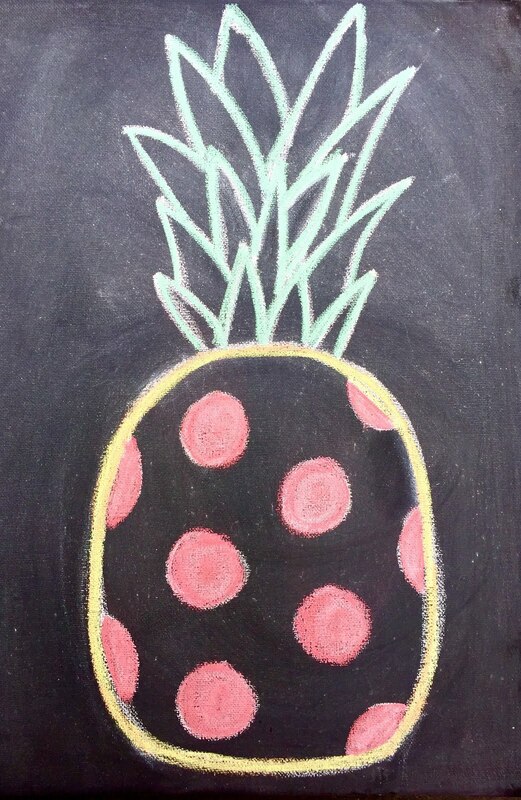 Suffice it to say, I love spots, and pineapple, and alliteration. Thanks for reading!